The MIT student group United Trauma Relief has petitioned Kirk D. Kolenbrander, special assistant to the president and chancellor, requesting standards for workers who produce MIT-licensed apparel. Professor Wesley L. Harris and his wife Sandra Harris, potential candidates for New House housemasters, met residents of the dorm Thursday. A large group of MIT students unsuccessfully attempted to recover the MIT mascot’s stolen paw Friday evening. 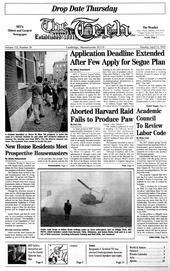 Approximately 25 students participated in a botched raid on an empty Harvard dormitory room, which ended abruptly when one of the room’s inhabitants returned. MIT’s “Senior Segue” plan, designed to alleviate the anticipated housing crunch next year, has thus far failed to attract enough juniors from undergraduate dormitories into graduate halls. The Undergraduate Association Council elected Benjamin J. Zeskind ’03 as speaker for the 2002-2003 academic year last night by a unanimous vote.